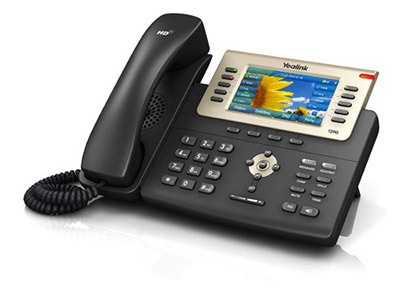 The Yealink SIP-T29G is a luxurious, color-screen SIP phone for business. This phone has 10 programmable line keys with dual LED color for status notification. The user-interface, crystal clear communications hardware, and programmable functionality make this phone a favorite in its class. Featuring a brand new full-color display, HD voice, and up to 16 SIP accounts (16 phone lines), the SIP T29G is the most luxurious, intuitive, and hardworking Yealink of its class. Included USB dongle allows for expansive capabilities, while other reminiscent features have remained — call history, 10 key programmable auto dial, and phonebook with up to 1,000 entries. 8 programmable feature keys include messages, conference, hold, mute, transfer, redial, speakerphone, and intelligent search. The HD handset and HD speakerphone included with the SIP-T29G provide crystal clear communication during your calls. Using the power of Yealink’s Optima Audio hardware and software, your communications will have never been clearer. The all-new USB port on the SIP T29G empowers your functionality more than ever before. Use Bluetooth, Wi-Fi, and USB recording features with ease. Security is always paramount. Using Transport Layer Security (TLS/SSL), the latest network security technology, never worry about a network breach. Staying hands free on the phone is a great feature for any employee. With headset capabilities, you aren’t tied to your desk while you’re on the phone. Manufacturer’s warranty can be requested through Telcom Savvy 24/7 live support. Check with the manufacturer regarding warranty issues. Still have questions? Feel free to call us at 631.621.3200. Monday to Friday from 9 am to 6 pm EST.